Seven hundred years ago, the cities of Europe were surrounded by walls. Kings and emperors ruled the land. Knights rode their horses through the countryside. And a man named Theodoric of Freiburg lived and studied in Germany. Then, as now, after a rain, and in just the right conditions, rainbows spread their beautiful colors over the land. 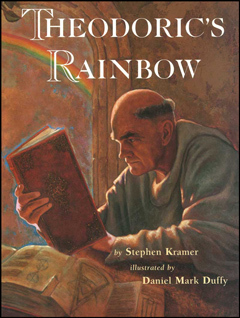 In Theodoric’s time and place, the rainbow colors were mysterious. Were they paths that led to pots of gold? Were they dangerous forces that would wither the finger of any who dared to point at them? Were they ladders to heaven? Theodoric decided to find out exactly where those beautiful colors came from. And, using a scientific method hundreds of years ahead of its time, he did.